We are upon another holiday season and I am looking forward to the gathering of family and friends and the joy of this time of year! As I was going through my holiday decorations this year, I was deciding if I still love the decorations or if I was ready to let it go. Here are 3 ideas and suggestions that I would like for you to consider this holiday season. Number One: As you get your holiday decorations out this year to decorate your home see if you still love the decorations and if you want to use them or is it time to donate them or throw them away if they are damaged. I know that every year there is a different “feel” to the holidays depending on what has been going on in your life. So as you take out your decorations this year, keep and put up the ones you love and if there are some decorations that you keep passing up every year to put up, is it time to let them go? If the decorations are a memory item, instead of keeping them tucked away in a box maybe put them out for everyone to enjoy! Number Two: Take inventory NOW of your wrapping paper, gift bags, name tags and bows before you go out and buy items that you don’t need. I always tell my clients before a holiday or a special event, find out how many supplies you have and if you even have to go out to buy things when you already have an abundance of supplies. Especially use up the large gift wrap rolls that are too long and do not fit in a stand up gift wrapping storage bin. Or donate or recycle gift wrapping supplies that are for a special age of kids that you don’t have anymore or the wrappings are in bad condition and you can not use them. Number Three: Simplify your decorations, party planning and events this year! This time of year should be fun, relaxed and not a stressful time of year. There are so many events that are scheduled now and what is asked of you, it is ok to say no at times. Make time to get together with friends and family and maybe consider meeting at a restaurant instead of their home where they may feel the pressure to make things perfect. When you are putting together your shopping list of gifts for family and friends, think about what they love to do or really care about and get a gift that represents that. It should be about the thought of the gift instead of the number of gifts. 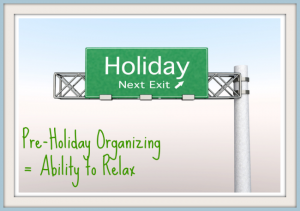 Please keep these ideas and suggestions in mind this holiday season and I am sure you will find peace and relaxation! I hope you all have a great holiday season and I wish you all the best in 2018!